Tight Spaces, Kesho Scott et al. 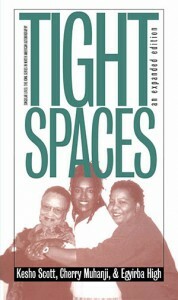 Although Detroit is the common home of Scott, Muhanji, and High and the three are related by blood or long-term friendship, the immediate origin of Tight Spaces was at the University of Iowa. 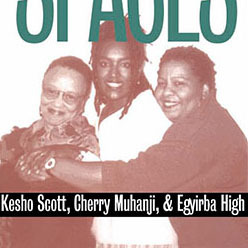 There the three friends migrated in search of interdisciplinary higher education in African American studies, American studies, and women’s studies. There all three in succession enrolled in a course, “Autobiography and American Culture.” It’s now clear all three were deeply affected, not only by reading ten or so American life histories but even more by the course’s midterm writing assignment: to write the opening chapter of one’s own autobiography. These stories and essays examine the social and physical geographies of the Midwest and the places of race, class, age, gender, and sexuality within them. These “tight spaces” are opened and explored, fleshed out and felt, in the sensitive, wry, and determined voices of the book. Scott, Kesho; Muhanji, Cherry; and High, Egyirba. Tight Spaces. Iowa City: University of Iowa Press, 1999.